Open Practice Day Fees with your own kart / bike: $65 – Track Fee ($45 for OVRP Members) for the day plus $15 – Pit Pass (required for all members of your group per day). 2019 OVRP race schedule IS POSTED! Top scoring races for each driver for championship points. 1 drop – DQ’s may not be dropped. Check “Forms & Docs” for classes, tire rules and fuel spec. Everyone is welcome to race at OVRPk. No engines running before 10am please. For Night Races, Practice starts at 3pm sharp. 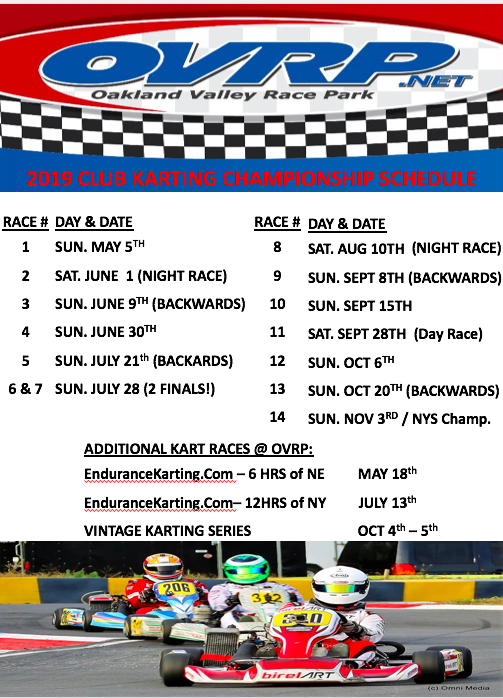 Fourteen OVRP Club Races, The New York State Championship Race, and Vintage Kart Racing provides plenty of on track action for anyone! We look forward to intense, exciting, battles…just like last year! And as always, we welcome the Vintage Karting Association in October for a 2 day event. CLICK HERE TO DOWNLOAD OR PRINT SCHEUDULE. For 2019 we are working closely with MyLaps and with Race Monitor to ensure we are using the full capabilities of both systems hardware and software. MyLaps will be utilized this year to track all race points for our Championships as well as track records for each class in any official session. Race Monitor will be a focus this year to ensure you can follow via your mobile phone. We will do our best to ensure this system is up and running properly. 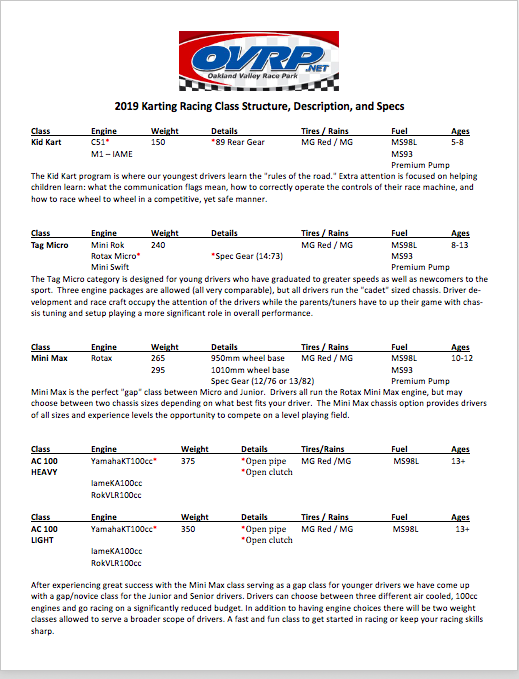 OVRP KART CLUB RACE CLASS STRUCTURE (RULES: COMING SOON) ARE LOCATED ON THE “FORMS & DOCS” PAGE OF OUR SITE AND ARE ALSO POSTED BELOW. OVRP KART CLUB RACE POINTS WILL BE LOCATED ON THE “FORMS & DOCS” SECTIONS OF OUR SITE. COMING SOON. 2019 McAleer Summer Kart Racing Camps and Schools: New Options! Expert instruction by World Class Karting Champion, Stevan McAleer and his team. Designed for drivers of all ages/levels, enhancing every part of their race-craft aptitude, focusing on the fundamentals of karting including; qualifying, cold tire laps, passing, starts, and race strategy–and that only scratches the surface of this proven curriculum. Again for 2019, McAleer will offer specific schools for Novice drivers and specific schools for intermediate/ advanced drivers. Bring your equipment, or rent ours! Register ASAP, classes have waiting lists every year.